﻿﻿ Who knew that you could plan a conference for 120 people in less than a week. 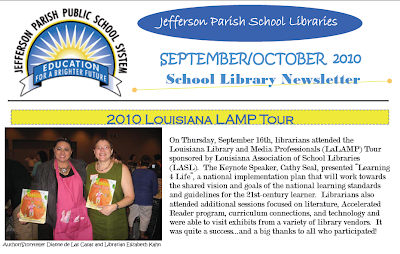 On Friday, September 10th I got a call asking if I would plan the afternoon sessions for the annual Louisiana Library and Media Professionals Annual Conference (LaLAMP) held in New Orleans on the 16th. The venue, exhibitors, and morning keynote speaker were all set. I had to plan the afternoon and put together the sign in sheets, evaluations, and certificates as well as get helpers to deal with all the paperwork. The Jefferson librarians really stepped up to the plate. Several of them put together one hour presentations, and those uncomfortable with presenting helped with the other tasks. My hats off to all the wonderful ladies and gentleman who helped get it together in record time.